CV/0 deleted Foundation course in history (1989); higher degree in European studies (1994); higher degree in American studies, University of Amsterdam, 1994. NIMA diploma (Netherlands Institute for Marketing) (1997). CV/1 deleted Policy adviser, GroenLinks Group, Second Chamber (1998-1999); policy adviser, GroenLinks European delegation (1995-1998). Trainee, European Commission (1994-1995). CV/2 deleted Member of the steering committee of the Council of Europe's European Youth Campaign against Racism, Xenophobia, Anti-Semitism and Intolerance (1994-1995). CV/3 deleted Member of the European Parliament (since 1999). CV/4 deleted Member of the executive (1991-1993) and Vice-Chairwoman (1993-1995) of the European Coordination Bureau of International Youth Organisations. Assistant, International Young Nature Friends (1993-1994). Committee member, NIVON (Dutch Institute for Adult Education and Friends of Nature) youth section (1985-1987). Foundation course in history (1989); higher degree in European studies (1994); higher degree in American studies, University of Amsterdam, 1994. NIMA diploma (Netherlands Institute for Marketing) (1997). 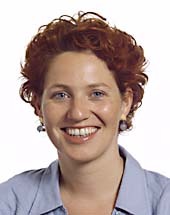 Policy adviser, GroenLinks Group, Second Chamber (1998-1999); policy adviser, GroenLinks European delegation (1995-1998). Trainee, European Commission (1994-1995). Member of the steering committee of the Council of Europe's European Youth Campaign against Racism, Xenophobia, Anti-Semitism and Intolerance (1994-1995). Member of the executive (1991-1993) and Vice-Chairwoman (1993-1995) of the European Coordination Bureau of International Youth Organisations. Assistant, International Young Nature Friends (1993-1994). Committee member, NIVON (Dutch Institute for Adult Education and Friends of Nature) youth section (1985-1987).